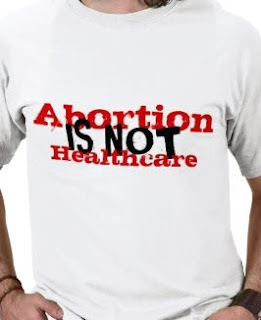 THE PASSIONATE PRO-LIFER TURNED ABOLITIONIST: Abortion isn't health care, it's MURDER! Abortion isn't health care, it's MURDER! A Christian middle-school student is suing his school district after a principal ordered him to remove a T-shirt bearing the message "Abortion is not health care" on the day of President Obama's speech to schoolchildren. Alliance Defense Fund attorneys filed a lawsuit in federal court against the West Shore School District in Lewisberry, Pa., Oct. 5 on behalf of a male, Christian middle-school student identified as E.B. The boy's parents, identified as the Boyers, said they were concerned about the president's speech and the national health-care debate, including reported funding of abortion within proposed legislation. "[T]he Boyers, like many others, felt that President Obama was bypassing them and speaking directly to their children without their permission," the complaint states. "… Like many others, the Boyers struggled with whether they should send their children to school on that day. E.B. attended school and decided to voice his religious viewpoint as it relates to the issue of abortion." The boy wore the T-shirt to his classes at Crossroads Middle School and said he received no complaints until his fifth-period teacher ordered him to go to the principal's office to determine whether the shirt was "appropriate." E.B. claims he was immediately told to remove his shirt "because it might insult somebody."